Engineered to deliver the speed and precision required during close-quarter work, the Kahles 1x26 Helia RD Red Dot Sight is outfitted with a simple 2 MOA center aiming dot that is big enough to be seen in tense or hectic situations without obstructing your target or cluttering your view. 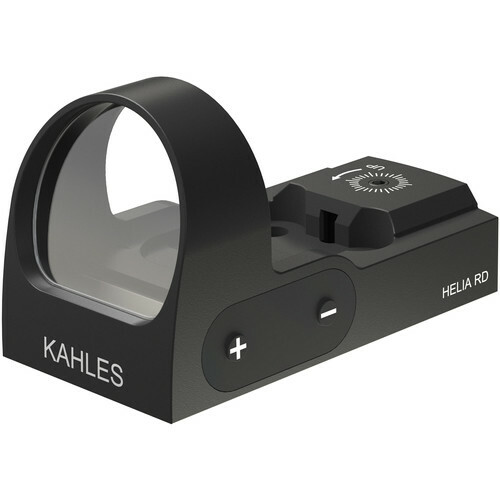 The dot sight window is compact to reduce snag hazards while presenting a nearly unlimited field of view and eye relief when using both-eyes-open shooting techniques. Its red illumination is easy to see in full daylight and in low-light conditions, and four illumination levels allow you to tailor the brightness to your personal preference or the situation. To get you on-target, it has a 1 MOA impact point correction with a wide windage and elevation adjustment range. An intelligent switch automatically turns the sight off to preserve the battery life, and the battery is easy to swap out when its charge gets low. A spare battery can be stored in the included rubber cover for convenience. The Helia comes equipped with an integrated clamp-style Picatinny/Weaver rail mount to make it easy to install on most rifles, carbines, and SMGs. Box Dimensions (LxWxH) 5.5 x 4.12 x 2.4"